Creating a shade garden will give you a relatively cool place sheltered from sun in which to garden in the heat of summer, sit and enjoy a good book or string a hammock for an afternoon nap. Remember that nothing will grow in deep shade, so cover those areas with an attractive mulch and focus your energy elsewhere. 1. Determine what kind of shade you have. If you have shifting, filtered sunlight, such as an area beneath tall pines, you can plant things that call for partial sun and partial shade. If you have an area with morning sun and then shade beginning mid-afternoon, you really have a full-sun location. 2. Shady areas often have tree roots close to the surface, which can be damaged by digging in the soil around them. Adding soil to accommodate new plantings can bury tree roots and kill them. Container gardens are a good option in shady areas if you have a lot of tree roots. 3. Creating texture with foliage is a great way to add visual interest to your shade garden. 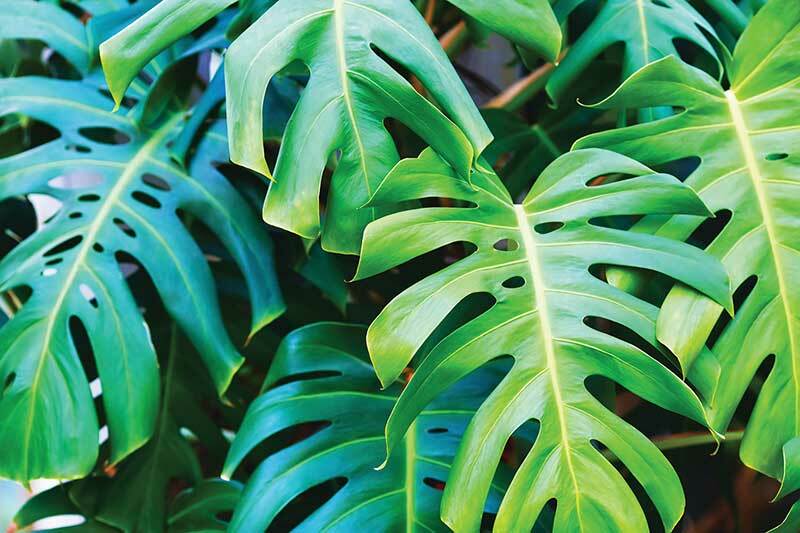 The varying leaf shapes and shades of green make ferns, split-leaf philodendron (Monstera deliciosa), variegated shell ginger (Alpinia zerumbet “variegata”), fancy-leafed caladiums (Caladium x hortulanum) and leopard plant (Farfugium japonicum) an attactive combination. 4. Perennials with light-colored flowers make the best display in shady areas. Darker flowers don’t show as well. Try the white flowers of oakleaf hydrangea (Hydrangea quercifolia) and pink ones of Persian shield (Strobilanthes dyerianus). Beneficial wasps help control more than 200 species of pest insects. There are many different species of beneficial wasps, and most of them are solitary and do not build nests. These tiny guys, so small they are usually invisible to the naked eye, are your friends. They attack pest insects such as stinkbugs, aphids, caterpillars and scale insects. They control pests by stinging them, then laying their eggs inside or on the host pest. The venom from the sting paralyzes the host, which stops eating on your plants. The eggs then incubate in the host, the larvae hatch and mature, they chew their way out and then spin a cocoon on the outside of the host. After a week or so of pupating, they cut an escape hatch in the cocoon and fly away to find a place to start the process all over again. While you can’t see the beneficial wasp, you can often see evidence it has done its work. The white, fluffy cocoons on the back of a tomato hornworm are evidence a wasp has “parasitized” it — stung it and laid eggs. Either let the hornworm be where it is or remove to a safe place so the wasps can finish maturing and keep the beneficial cycle going. Wasps are also pollinators, just like bees. Do not confuse beneficial wasps with predatory wasps, such as yellow jackets or hornets.